Over 162,000 British and Irish convicts were transported to Australia between 1787 and 1868. Roger Kershaw explores the reasons behind the policy of transportation and looks at the experiences of the people who were shipped beyond the seas, using case studies from the archives. Assizes: Midland Circuit: Crown Minute Books, 1818-1820. An example of a John Jobson - stealing goods and being sentenced to transportation for 7 years. Home Office: Criminal Registers, England and Wales (Bristol). When a sentence of transportation was passed down, he or she would be returned to jail where he or she was awaiting trial and there they would await transportation. Home Office: Judges' Reports on Criminals, 1797. There were also petitions to reduce a sentence of death to that of penal servitude (which would include transportation). Many of these are in the series HO 47 searchable by name of convict on our online Catalogue for the years (1784-1830). I’ve got about, as you can see from your handout, there’s about 50 or 55 slides here so it’s going to be a relatively quick gallop through records we’ve got but also some records elsewhere relating to transportation to Australia. And throughout the talk I’m going to use a case study of someone called John Jobson who was transported to Australia in 1820 and you’ll see him cropping up in some of the records that I put up on the screen. John Jobson, interestingly enough, was the great, great, great, great grandfather of a member of the staff of The National Archives. A member called Adrian Jobson is one of our medieval specialists so it’s thanks to Adrian that we can use him as a guide to the records that we hold here. And really today’s about introducing the subject of transportation to Australia to you if you’re not particularly familiar with it, I mean it’s very much kind of like a beginners / intermediate kind of lecture on the subject. As I say I can’t really do the whole subject justice in an hour so you might feel that I go over things a little bit too quickly. But hopefully we’ll have some opportunity for questions at the end which I’m very happy to take. So what I’m going to cover today are records relating to trials, particularly those that are available at The National Archives. The National Archives holds the Court of Assize records of those of the central criminal court also known as The Old Bailey Sessions. Quarter Session records are kept locally at county records offices and we’ll come back to the differences in a little bit of detail. We’re also going to look at pardons, appeals and petitions so when a death sentence is commuted to a sentence of penal servitude or transportation. And we’re going to look at transportation lists themselves which are records where prisoners are awaiting transportation to Australia, such as registers, but also ships records which would include surgeon’s health records as well. There are a number of research guides which hopefully you’ve got on your seats today. There’s three in particular that you can pick up on site or download freely from our web. One’s called Transportation to Australia 1787 to 1868. The other one is Tracing 19th Century Criminals in The National Archive and the third one is looking in more detail at Courts of Assize records, tracing trials of criminals. You can take it further. There are three books that cover the subject in some detail. One that was published in February this year was one I wrote was called Migration Records: A Guide for Family Historians and then two or three years I wrote with a colleague Mark Pearsall, a smaller guide called Family History on the Move. Probably the best TNA publication is one called Bound for Botany Bay, British Convict Voyages to Australia, written by Alan Brooke and David Brandon so if you really wanted The National Archives book on the subject this is the one to get. So let’s look in a little bit more detail at trial records. As I say The National Archives hold records of the Court of Assizes and Assize Courts were where the more serious capital offences were heard. Prisoners were tried at Assize Courts, which were held twice a year in county towns by visiting judges and the records are preserved as are the Assize Court equivalents of London and Middlesex. And these are known as The Central Criminal Court records, or more commonly known as Old Bailey records. 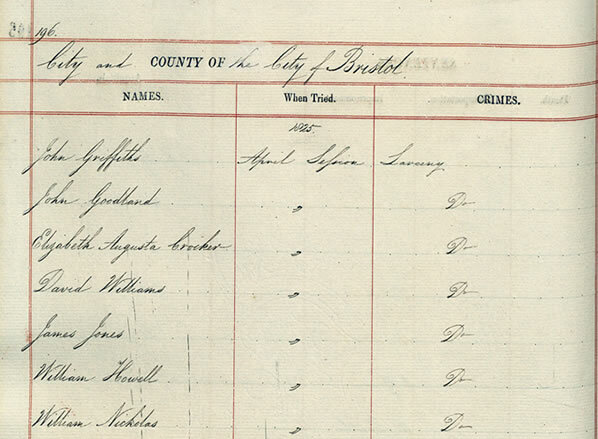 Quarter Session records, on the other hand, are held locally at county archives and these sessions were held four times a year for less serious offences but some were serious enough for a sentence of transportation. So the court records may well be here at The National Archives or they may well be at county record offices. But some of the sources I’ll be showing you later on can actually identify where the person was tried. So there’s lots of clues in the records that we hold. Just to give you a bit of background for those of you who don’t know. It’s estimated that over 162,000 British and Irish convicts were transported to Australia between 1787 and 1868. And such a massive movement involved hundreds of ships and thousands and thousands of associated groups of individuals such as magistrates, judges, private contractors and agents who were responsible for safely transporting the men to Australia, and women. Merchant seamen and officers, surgeons onboard ships and of course the convicts themselves. So why did they transport to Australia? Well it was simply because of the defeat of the British in The American war of Independence in 1776. It resulted in America no longer being a destination for transportation. Transportation itself had really been as a policy up and running from 1618 right through to 1776 when some 50,000 men, women and children had been dispatched to America. So why was there a policy of transportation? It was really the result of The Transportation Act of 1718 which allowed the courts to sentence non-capital offences i.e. those who could claim benefit of clergy to seven years transportation or fourteen years for capital felons. And benefits of clergy gave clergy the privilege of being tried in ecclesiastical courts and not civil courts. And ecclesiastical courts could not impose the death penalty. And over the years the practice developed that prisoners charged with a felony could plead benefit of clergy if he or she could prove that he, like a clergyman, could read. And the act made it very clear that the transportation was in fact a deterrent to crime because it was quite difficult for someone to return back home once they were transported. And it was also an effective means of supplying a colony with a labour force, so there’s an economic reason behind it as well. So I mentioned John Jobson before. This is the first time we’ll see John Jobson, we should see his name just here further down the screen where it says John Jobson stealing goods. And that’s why he was convicted. This record is from the Court of Assize and specifically it’s Assize 11/1. And it’s a Crown minute book from 1820 for the Midlands circuit, so it will include the county of Warwickshire which is where John Jobson was born and committed his crime. He stole goods and he was sentenced for transportation for seven years. These records are not available online, currently you need to research them among the original sources held here. Very rarely do you get a name index, I couldn’t just type in John Jobson and this would come up. This particular record is arranged by county or district so it will be under Warwickshire or Midlands circuit and it will say Minute books for 1820. And by ordering up this document you then wade through it until you find the guilty charge for John Jobson. Records of central criminal court or Old Bailey, there’s been much more effort there to put them online and there’s a dedicated site called www.oldbaileyonline.org. So for Assize records, in many cases as I say you’re searching by the year and by the county or circuit. And there’s a number of different records in Assize records, this is a Crown minute book and there’s also records of depositions, indictment, jail books. So they all tell you different things. What they don’t tend to do is give you a transcript of the court proceedings. Those records simply haven’t survived for Court of Assize records. You need to rely on local newspapers which you can often find in county archives or at The British Newspaper Library at Colindale. But they do tell you things like the charge, the sentence, sometimes a list of jurors and here a list of the 12 jurors who were present on the case of John Jobson. A little bit more information about John Jobson. He was born in Birmingham in the early years of the 19th century and his first appearance in the records is this one when he was 15 years old. And in the record, which is dated the 27th March 1820, he was brought before Mr Justice Best at the Warwickshire Assizes on charges of theft, specifically a pair of pistols to the value of £15. His plead was not guilty but he was found guilty, and unfortunately for this case as I say there are no surviving indictments or depositions so you can’t get any further for this particular case from the information you’ve got here. As I mentioned before, if you have an ancestor who was tried in the Old Bailey or the Central Criminal Court, this is the website you have to go to which is www.oldbaileyonline.org. And you can search cases between 1674 and 1913 by just going through the search pages. The records are held here but what you’ll find is that they’ve been indexed by individual and that site’s been up and running for a few years now. So once sentence has been passed the convict would be returned to the jail where he or she was awaiting trail and there they would await transportation which could take quite a while, particularly in the initial early days of the transportation to Australia. And these are known as Criminal Registers. They are arranged by county and there are two series, one is HO 27 which is the series for England and Wales between 1805 and 1892 and there’s a series HO 26 which is specifically for prisoners in the London and Middlesex area. And as you see they are arranged by county and by year chronologically and you get their names, you get where they were tried, the month, the year, so then you can go to the Assize records if you didn’t know that. It gives you the crimes they were convicted of and their sentence. So you’ve got a couple here who were sentenced to 14 years or seven years transportation. Others who were just imprisoned, so penal servitude in Britain. Unfortunately these records haven’t been indexed so you can’t just type in the name of someone. There has been some attempt to index them. We’ve got some supplementary finding aids particularly for the London ones in our open reading room but by and large you really need to know where they were sentenced, which county, and roughly what year and then start working your way through the books. John Jobson, for your interest, waited at Warwick prison awaiting sentence but like many who had pleaded not guilty, he submitted a petition for mercy appealing for the revocation or reduction in his sentence. When we talk about appeals, this is a typical one, this is a judges report, HO 47/21. And it’s a typical petition to reduce a sentence of death to that of penal servitude, which would have included transportation. As a result of a long going cataloguing project all of these records in HO 47 between the years 1784 and 1830 are searchable by name of convict and by crime, and [they have] a lot of detail about the individuals. So it’s worth checking if you think you have an ancestor who would have appealed against the sentence that was passed down. Within the same series you can get reports of criminals. This is within the same series, it’s HO 47 piece 52 and it’s from the year 1813. And it’s a return of women convicts in 1813 in Newgate prison awaiting transportation together with their individual pleas of mercy, which would have gone before the judges who in most cases have ignored them. This is a different series. This is HO 6, judges and recorded returns. In this particular return royal mercy had been granted so these people were sentenced to death but their sentences were commuted to transportation, so they would have probably been sentenced to 14 years transportation. This particular series you can’t search by name, you just work through the returns for a given year. And there in the same document is just more details of the individuals who were granted mercy. These were individuals who were tried in Warwick at the Warwick Assizes and there’s the names of those people. And this is the decision that was made. So awaiting transport. Prison hulks were essentially floating prisons on the banks of the Thames and they were originally intended as a very short term method of imprisonment when Britain was at war in America during The American War of Independence in 1776. But as the war prolonged and Britain was defeated it was clear that America couldn’t be used as a destiny for transportees and all of a sudden the number of hulks increased, and particularly the population on the hulks, from 500 men in 1779 to nearly 2,000 in 1783. So they were at the point of bursting in 1787 when the first fleet began its voyage to Botany Bay. So you’ll find an awful lot of people on hulk registers between 1776 and 1787, and even beyond that because there was still a period of waiting before the ships could go to Australia. Interestingly enough only men were kept on hulks. You won’t find any female convicts. One of the reasons for that is that hulks were actually known as ‘hell on water’. This is a cartoon or drawing from The Illustrated London News from 1846 and they were very dark, they were quite brutal, demoralising. They’re a place of confinement and they were filthy and increasingly they were overcrowded. And many were based very close to each other on the south bank of the Thames at Woolwich and Deptford. And as I said before, they were established as a temporary expedient by an Act in 1776, but they actually continued in existence until the mid part of the 19th century. John Jobson languished for two years on the hulk, the Bellerophon. Remember he was sentenced in 1820 and he actually was on this hulk between 1820 and 1822 before embarking on the convict ship, the Guildford, on the 29th March 1822. So he had about 18 or 19 months on the hulk. And he also escaped the term child convict. A child convict or child transportee was a child whose sentence began before the age of 16. But by the time he set sail for Australia he was actually 18. We’ve got quite a lot of records relating to hulks. Not many have been indexed by name of convict and normally they’re arranged quarterly, so you get four to a year, and they’re arranged by the name of the actual hulk. This is actually the Leviathan which is the hulk in the series HO 8/18. So HO 8 is the series of records you need to consult if you’re searching for people on prison hulks. And as I say they were particularly overcrowded leading up to 1877 when the first fleet set sail. And of course there was this period between 1776 and 1787 where there was lots of discussion about where the next penal colony should be. And West Africa was considered but actually the decision of Australia was taken in or around 1785/6. This is HO 9 by the way. This is an index. Some of these books or these records come with indexes at the back so even though I say they’re not indexed on the catalogue once you call up a document there will be an index at the back of the book which will then take you to an individual convict. So it’s not quite as bad as it might seem if you don’t have a particular month or year. 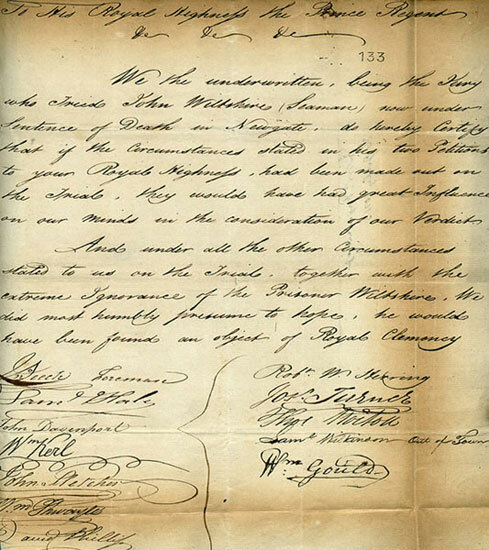 This is the document which effectively established New South Wales as a penal colony and its correspondence, New South Wales’ original correspondence, with the governor of New South Wales, and the record is CO 21/2, CO standing for Colonial Office. This document effectively establishes New South Wales and it states clearly that there is a benefit to New South Wales in the sense that there’s going to be labour in the colony and there’ll be an economic advantage and benefit as a result of that. So there’s benefits both to the convicts and to the state. So the records of transportation start from this point. This record is from a series HO 10 which is a Home Office series recording settlers and convicts to New South Wales and Tasmania from 1787 right through to 1859. And they’re essentially lists of male and female convicts, indicating their sentences if they were convicts, their employment and their settlement in the country and also provide information of land and cattle acquired by them, and any other information such as lists of pardons granted and convicts embarked for and arriving in New South Wales. And this is part of the first fleet. This is HMS Supply and Sirius. The Sirius was the first fleets’ flagship while the Supply was its smallest vessel. The Sirius reached Botany Bay, we think, on the 20th January 1788. And in total there were a fleet of 11 ships that left Portsmouth on the 13th May 1787. So it took than about eight months for them to arrive, all 11, between the 18th and 20th 1878. And it’s amazingly successful because they’re under the command of Captain Phillip and on board there were some 750 convicts, mostly men, of them there were about 200 women. And they were guarded by nearly 200 marines and officers. And in total there were about 1,200 people of which only 24 did not survive the eight month journey, which was something like 0.2% of all on board. And this was despite the extreme heat and associated diseases. It wasn’t always successful though, the second fleet two years later was quite famous for the number of deaths on board and also the attempts of mutiny as well and all sorts. But the first fleet was incredibly successful. One of the more famous or popular series of records we have are lists of convicts transported. This is HO 11/5 and all of these records can now be searched and downloaded by subscribing to www.ancestry.com.au. And you can also search these using the library in Victoria. So, what does it do? It tends to give you the names of the convicts who were being transported, where they were convicted and when they were convicted (the conviction dates). The state library of Queensland actually has its own website where you can freely search for details and transcriptions of anyone who appears and all of these records going from 1787 through to the 1860s. And that’s, if you haven’t seen it before, the front page of the State Library of Queensland site which is www.slq.qld.gov.au. And John Jobson can be found on these. Remember John Jobson set sail on the Guildford in 1822 having spent two years in the prison hulk called the Leviathan. Remember he was found guilty in Warwickshire Assizes of stealing two pistols. Well he set aboard on the Guildford on the 7th April 1822, bound for Port Jackson under the captaincy of Magnus Johnson. And it was the fifth voyage of the Guildford to New South Wales and it stopped just the once on the way. And the passage lasted 99 days which was incredibly quick and it was one of the fastest made by convict ship. We can see John Jobson I think on the next page, second from the bottom. And living conditions had improved since the second fleet sailed, especially from about 1815 because from 1815 each convict’s ship carried a naval surgeon on board, whose role it was to supervise the general health of the transportees and crew throughout the passage. Because remember on each of these convict’s head there was a price and the people who were arranging their transport were paid considerable fees to actually safely get them across to Australia. So it was in their interest to make sure they were well fed and looked after as best as they could be. So who actually transported? You can summarise them into four categories. There were rural convicts, essentially those from a farming background, political prisoners or exiles such as 19th century riotists, significantly the swing rioters of 1830 and those involved in the Chartists Movements of the 1830s and 1840s. There were female convicts, out of the 162,000 it’s estimated that 26,000 were women, so it was probably about a sixth of all those who were transported. But there are also child convicts, of which it was estimated that 90% were boys and 10% girls and a child was anyone below the age of 16. And between 15,000 and 20,000 children were believed to have been transported between 1787 and 1868. Now John Jobson, as we heard before, was a rural convict, he was from a farming background in rural Warwickshire. And of the 172,000 people transported 70% were believed to be English, 25% Irish, 5% Scottish and less than 1% Welsh. And they’d all either go to New South Wales or Van Diemen’s Land which then became Tasmania. Western Australia was the destination for the vast majority of Irish convicts. And most Irish convicts were rural. Their crimes would range from disturbances to stealing cattle. And prisoners from rural areas fell foul of the Game Laws which made the killing and poaching of game a serious offence and poachers were often seen as heroes, especially between 1750 and 1830 when tensions between the landowners and ordinary people ran very high. And the availability of transportation led to a significant reduction on the number of executions in Britain. The numbers of people sent to Australia increased between 1811 and 1830 and the peak years were seen to be the 1830s when over 43,000 men and 7,000 women were transported. And this is well over three quarters of all those convicts who were transported after 1830. But let’s look at some of these other groups. This is just a cartoon of 1792 which offers a satirical depiction of convicts leaving their loved ones before embarking for Botany Bay. And whatever the reason for transportation there was always the associated trauma. 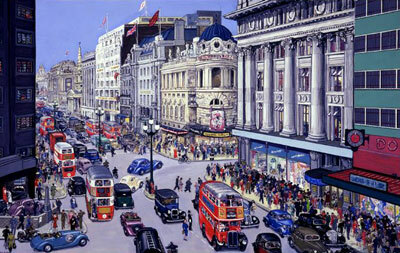 The domestic impact of transportation on families and communities was felt in villages and towns throughout the country. And there are thousands and thousands of letters in The National Archives addressed to The Home Secretary appealing to him to allow wives and children of convicts to go to Australia with them on a free passage. And most of these letters were unanswered or left unheard. Here’s one such letter, it’s an extract from several thousand similar moving letters received by The Home Office during the convict years. This particular example from a prisoner sentenced to transportation for life begs that his wife be allowed to accompany him. And as I say such letters would have probably gone unanswered. Only years later when a convict received what was known as a ticket of leave (we’ll come back to that in a moment) could he or she legitimately make an application for one or more members of the family to join him or her and it was more likely to happen then. Here’s another cartoon, this is in The Illustrated London News of 1849. It’s just typical scenes of an emigrant ship. And then the rowing boat over to New South Wales. This document here is a registration, or part of a registration, for application for passengers to the colonies, for colonies’ families. And this dates between 1848 and 1873. These convicts who gained their ticket of leave, as I said, could then invite families to join them in Australia. And this is a register of such passengers being agreed and being carried out by The Colonial Office. Unfortunately by then (we’re talking 14 years) because of the life expectancy being much lower than it is now, relatives were often too ill or too poor to travel or had rebuilt their own lives in the years of absence. But nevertheless obviously some families were reunited as we can see in this particular document here. OK, I talked about the groups of people who were transported, we talked about rural transportees. There’s also political prisoners as well. And this is a poster offering the reward for information about the Swing letters. It’s dated 1830 and it’s part of the correspondence for The Home Office in the series HO 52. Swing riots were a response to low wages and poor conditions particularly in the South West and East of England in 1830. And tactics such as rick-burning and cattle maiming provoked a ferocious response from the authorities. Political prisoners such as Swing rioters accounted for only 2% of all those who were transported but they were nonetheless very significant because their convictions had a traumatic effect on the entire community. And most of these men of course weren’t hardened criminals, they were educated men. So they were very different from who you’d expect to be transported. And they were really convicted for pretesting against the loss of their livelihoods caused by changes in rural work such as the introduction of new agricultural machinery. And the Swing riots of 1830 to 1831 were an agricultural phenomenon. There were over a thousand separate incidents of machine breaking, arson attacks and other disturbances in counties across the South, the West and the East of England. The riots were as a result of the decline in prices of agricultural produce, lower wages and the introduction of the thresher machine and the influx of cheap Irish labour. And as a consequence 2,000 were arrested, of which 19 were executed and over 500 transported, 132 of which were transported on the convict ship the Eleanor which sailed from Portsmouth to New South Wales in 1831 and 1832. And round about the same time you had the Chartist movement. So this is from the series HO 40. It’s still a correspondence relating to disturbances and this is a notice of a Chartist meeting being held at Carlisle on the 21st May 1839. And Chartists were the largest working class political movement of the 19th century and their public meetings alarmed the authorities. Many Chartists were transported for their activities. Essentially Chartists demanded the radical realignment of political power including a secret ballot and an extension of the vote to all males. And there are three core years of protests, 1839, 1842 and 1848. In 1839 an armed Chartist uprising took place in Newport resulting in the deaths of 22 people. The intention was to seize the town and then secure the release of Henry Vincent who was a leading Chartist speaker but the plan failed and three were sentenced to death, their sentences commuted to transportation after large scale protests. And the riots in Newport were typical of riots in a number of places including Birmingham. And of course women were transported as well. As I said before we think around about 26,000 women were transported to Australia. And this is an illustration of female prisoners in Newgate prison. And most would have come from the London and Middlesex hotspots of soaring urban crime. And in this particular image they appear degenerate and unruly, a point often made by the ship’s officer who transported, as I say, over 26,000 of them between 1787 and 1868. As I said, women would not be awaiting transportation on prison hulks. They’d typically be in prisons such as Newgate. The earliest female convicts arrived on the Lady Juliana in 1790 and there’s been quite a lot written about that. It was also known as the floating brothel. But in fact less than 20% of women transported were known to have practiced prostitution. The majority were convicted for larceny or crimes against poverty. And the women would bring useful skills from generally low paid employment, ranging from servants and housemaids to cooks, weavers, nurses, boot makers and jewellers. And most were often young, in the 21 to 25 year range of childbearing age and ideal to contribute to a future labour force. And the final category that I include on the slide before was children. This is a drawing of street urchins practising their skills in London from the Dickens novel Oliver Twist. And this is from the famous cartoonist Cruikshank. And there were many Artful Dodgers who were convicted and sent to Australia and for some transportation was a chance for a new life, if not better life, than where they’d come from. Child transportation existed as early as the first fleet, when a 13 year old girl called Elizabeth Hayward was transported for stealing a linen dress. And large numbers of child convicts were placed on a child hulk especially designed to accommodate children in the 1830s and 1840s. And many of these children would end up being transported to New South Wales or a boys penal colony in Point Pure on Van Diemen’s Land, which became Tasmania. And over 200 were brought on one journey by the convict ship the Elphinstone in 1842, and children, as I say, were classed as being anyone under the age of 16. But very few child convicts were under the age of ten. So why were children transported? Well, Victorian society did not look kindly down on children, children were abandoned in the growing industrial age, there was a surplus of labour for jobs that were there and there was high mortality rates for parents. There was no kind of welfare for children really until the mid to latter part of the 19th century, where you had children societies like Dr Barnado’s and the pioneers of child welfare. But until then I’m afraid this explains why so many children got involved in child crime. I said Elphinstone was the ship that took all these children to Van Diemen’s Land in 1842. This is a list of some of those children on board. As you can see on this particular page they range from 13 years old through to 16. And you get exactly the same information that you’d expect to get from the transportation registers we saw earlier. So an indication of what their crime was, where and when they were convicted, what the sentence was, whether they could read or write, and then there’s a report from the jailor. This is in the series of records by Privy Councils, so it’s PC 1, but unfortunately there’s no index by name, it’s a case of going through the particular year if you happen to know the ship that the convict was on board. I don’t know whether many of you have been to the Port Arthur Heritage Centre, it’s somewhere that I managed to go to a couple of years ago. It’s a fascinating place where there’s a huge heritage centre. And a lot of the adults were kept at Port Arthur, but just around the coast, or very close by to Port Arthur, was the child colony known as Point Pure, which closed in 1849, but it was surrounded by water and a large shark population. And this was the whole of Port Arthur. Prisoners were virtually sealed off from the rest of the world. But Point Pure was part of that and it closed in 1849 having been a juvenile colony for 800 boys. And the boys who were on the vessel you just saw before, the Elphinstone, were destined for Point Pure. They were situated just across from Port Arthur. It survived for 15 years and in that time admitted, as I said, around about 800 boys. It wasn’t the only place to confine young offenders. There were also barracks. Carter’s Barracks in Sydney accommodated child convicts between 1820 and 1835 and The Swan River Colony in Western Australia between 1842 and 1849. But the biggest one was Point Pure. This is an interesting series of records. It’s a questionnaire of sorts, a series of questions for one John Edwards who was imprisoned in 1836 for stealing money from a shop. It’s a Home Office record. It’s HO 73, it’s a report from a commission I think to try and understand crime and how people re-offend or don’t re-offend. And this guy called John Edwards is answering questions to show his family background and social conditions that ultimately led many boys into early delinquency and crime. So the voyage over. As I said, the voyage could be as short as 88 days. John Jobson was on a voyage that lasted 99 days but the record they think was 88 days, towards the end of the transportation in the mid-1850s. But they could last up to seven months and that was the period of time it would take to reach Australia, certainly in the 1780s and 1790s when transportation started. So what records do we have on the voyage over? Well we have surgeon’s reports and we’ll come back to those in a moment. There are records of convicts where they were keeping order so there were punishment books. There are medical records indicating how people sadly would die on board and there are records of particularly diseases such as scurvy. So we can just look at some of these fairly quickly. This is a surgeon’s report and you’ll find surgeon’s reports by and large in the series of records ADM 101 because they’re actually Royal Navy records. And this is the medical journal of the convict ship called the Ocean, which sailed in 1823. In it the surgeon superintendent describes a case of attempted mutiny, because you would get mutiny on a lot of these journeys that lasted several months. And in addition to completing medical journals these men were expected to document unusual and untoward cases involving disciplinary measures. So they’re a fantastic resource. You see the title medical journal so you assume it’s purely about medicine but actually it’s more about keeping order, obviously medicine but also disciplinary measures. At the moment the records are arranged by name of ship but there’s a joint project with The Wellcome Trust where we’re actually indexing them by name of convict who was seen, and by the names of the surgeons themselves, and the diseases that were found. This is the journal for the convict ship called the Guildford in 1822. As we know this is the ship that John Jobson was transported on. And it was from 1815 that each convict ship carried a naval surgeon. So it’s from 1815 that you’re more likely to use this source. 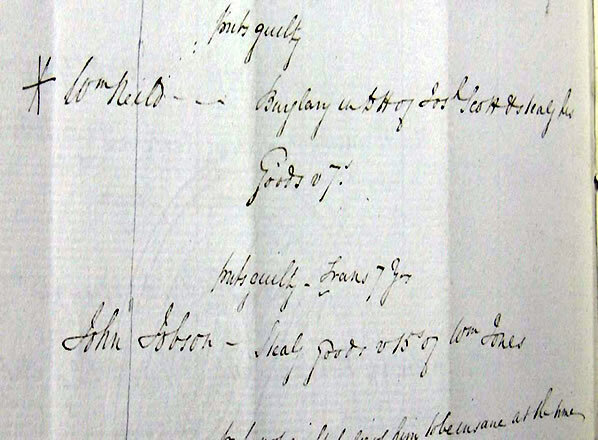 As we know John was transported for stealing two pistols and the Guildford surgeon was a Dr James Mitchell who recorded in his log details of all those who required his services. On the 7th July the log notes that John Jobson had reported to sick bay. Diagnosed with a serious face infection, he was put on a low diet and given a treatment involving an ammonia compound. After three days he was well enough to be discharged. And as I say, hopefully by May 2010 we’ll have fully indexed these records on our catalogue, so you can then for the first time search across by name of convict to see whether your particular ancestor or whoever you’re researching was seen by a naval surgeon. As I say, naval surgeons were also responsible for recording punishments, so here we have a Punishment Register or list for the various crimes and punishments which were meted out to offending convicts during the voyage. And that’s a front cover of a medical journal. This is for the convict ship the Barossa between 1841 and 1842. And funnily enough, one wouldn’t think this but from the introduction of having a ship’s superintendent surgeon in 1815, the death rate among convicts was far lower than those among free, emigrating law abiding citizens, which seems slightly odd but was certainly true. And this particular journal is quite a useful one to use. This is a sick book of the men who were treated on the Barossa in 1842. And you can see the diseases typical of the time included diarrhoea, constipation, catarrh, phlegm, rheumatism and dyspepsia. And this is a different medical journal, this is for the ships the Isabella and Java dated 1833. Depending on the surgeons some accounts are very detailed and in total there are well over 800 journals. But unfortunately some are missing as not all ship’s surgeons chose to keep one so it’s pot luck. It’s estimated that about 25% of all convicts saw a surgeon on each voyage. Obviously that fluctuated depending on the diseases of the time. This is a very early sketch of the disease scurvy. And within this document, which is the medical journal for the convict ship the Barossa, there’s an essay on scurvy with watercolour illustrations of its effects such as this one here by a Dr Mahon. Scurvy was obviously a dangerous disease for those at sea for long periods and was finally brought under control by the use of lemons and other citrus fruits, because essentially scurvy is a lack of Vitamin C and it killed thousands each year both at home and at sea. Deaths at sea from scurvy exceeded all deaths from shipwrecks, other diseases and battles combined. It’s estimated that scurvy killed over one million people between 1600 and 1800. So the final section is really the end of the sentence. So what happened when somebody completed their seven years or 14 years transportation? Well there’s what’s known as a ticket of leave passport, a certificate of freedom. And then we’ll finish off by trying to appreciate why the policy of transportation ended when it did in the 1860s. This is a Colonial Office Series record CO 280. And it’s a return of convicts who offended at Launceston and Hobart in Van Diemen’s Land. And the offences listed would appear to be fairly minor although one convict’s retribution resulted in a one year extension to her sentence. But generally speaking convicts wanted to complete their sentences and establish themselves as landowners, tradesmen and free settlers. One exceptional case was Richard Dry, convicted in Dublin in 1877 of political activity and transported to Van Diemen’s Land. In 1818 he was given a grant of 500 acres and by 1827 he was working 12,000 acres with 400 cattle and 7,000 sheep. So obviously there are some convicts who ended up doing extremely well in their own right. And this is the ticket of leave passport for the convict Thomas Griffith issued 13th May 1845. Ticket of leave passports were granted before the sentences had expired but they required the convicts to seek employment and report regularly to local magistrates. So it’s kind of a series of parole really. It was intended to limit government expenditure by reducing what was paid out to feed and house convicts engaged in public work. And it enabled prisoners, after satisfactory serving a minimum part of their sentence, to make a living on their own under this parole system. None of these records are held by The National Archives by the way, they’re all held in archives in Australia. And this is a register, again this is held in The New South Wales state archives, but it’s a register showing the granting to John Jobson of his certificate of freedom. You can see there’s a physical description of him, presumably if he were to re-offend, and it tells you where he was convicted, when he arrived. So why did transportation end? This is a caption or cartoon from Punch magazine in 1864. And it shows the growing resentment by free settlers and many ex-convicts about the continuing despatch of British convicts to exile in Australia. To encourage a growing desire and supply of free settlers, free inhabitants were required to pay much of the cost of managing convicts because there was a long term economic benefit of transportation. And at home in Britain also there was an increasing view that transportation was actually a very cruel method of confinement and it was increasingly becoming an ineffective system. And very few people were transported from the mid-1850s onwards. And Western Australia and Van Diemen’s Land and New South Wales would all stop at different times but the last ship was noted to be in1868. So what happened to John Jobson just to finish off with? Well John Jobson became a free man at the age of 22, at a time when New South Wales was enjoying a period of growth. Land was cheap and labour was scarce and by the end of the 1828 New South Wales census, which we have here, he was living in Sutton Forest working as a bullock driver for a John Edwards. Within a few years he had settled in Bungonia, about 77 miles South West of Sydney. And he married a young woman named Eliza Weeks who had arrived in Australia in 1832 as an assisted free immigrant. And they married in 1835 and had 13 children, the last being born in 1853. And that’s not John Jobson, that’s one of his sons, it’s actually his second son a William Jobson, so the second son of John and Eliza. And that is the grave of John Jobson, who died in 1880 at the age of 73. And he was buried in Goulburn which I guess is in New South Wales. And that’s the cemetery that my colleague visited two or three years ago just to put the final touches to the story of John Jobson. And he also picked up John Jobson’s death certificate which we see here. How John viewed his convict experiences is not known but it’s clear that he didn’t re-offend and he lived as a law abiding citizen until his death in 1880. Interestingly, though not necessarily surprising, is that the name of his father is recorded as unknown on the death certificate. Presumably nobody in his life would know what his father’s name was because he left Britain at the age of 18. Unfortunately some of his children however did turn to crime. This is the picture of Berrima courthouse and Berrima gaol. This is Lansdowne Park Farm near Goulburn. Charles and Henry Jobson, two of his children, were both imprisoned for horse stealing in 1866 and 1867. Of his other sons, John became a bush ranger being sentenced to 15 years imprisonment. And in September 1863, in Berrima gaol, he broke through the walls of his cell and remained at large until 1864. But that really concludes my talk. This is a very informative audio, but would be so much richer and more useful if we could see all the images Roger Kershaw evidently showed to his live audience. He mentions ’50 or 55 slides’. I feel that I have missed out on so much of the content because I had access to only three images. As a staff member for the Tasmania Family History Society and the Latter-day Saints Hobart Family History Centre, I deal with many patrons who ask where they can find more records of their convict ancestors. I would definitely recommend this if it included the slides. Thank you for you comments. We would love to publish all the presentations which accompany the talks but this is not always possible. This is usually because of copyright/licensing issues. Where a presentation features a combination of records from The National Archives and images from elsewhere, we publish an edited version with The National Archives’ images only.